My Grandma Leighton always sings a little phrase on the first day of spring... "Spring has sprung, the grass has riz, I wonder where the birdies is?" I've never lived anywhere else (except for a while in Canada to go to university) but right here in Michigan, however, my folks live in Boca Raton now, and there is no definable spring as far as I can tell in Florida... not really, not as I know it. So I got curious... what does spring mean to all of you, in your part of the world? Am I wrong? Is spring in Florida or California or Arizona or New Mexico different than the winter that precedes it? Tell me how... I want to know! 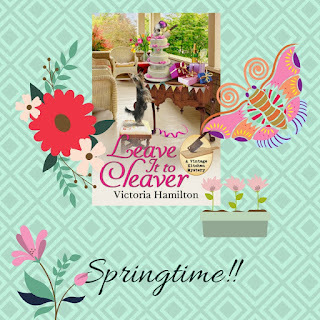 I'm so excited, Vintage Kitchen Mystery readers... the next installment, No Grater Danger will be published in May or June... I'll know more soon about the actual publishing date, and I'll have a cover in a month and a half or so to share! But until then, how about a draw? 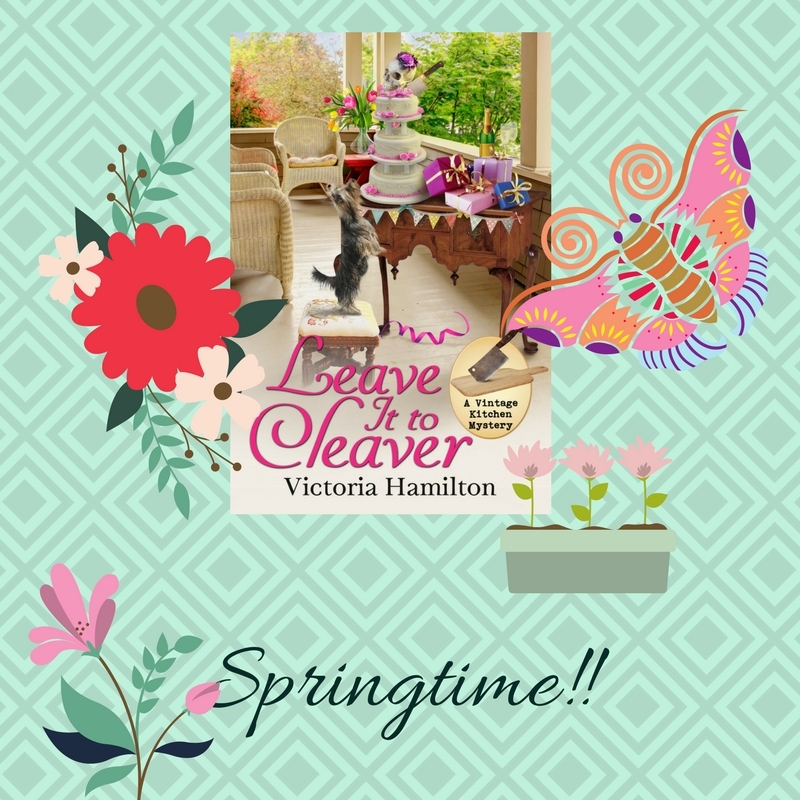 Tell me about spring in your part of the US and Canada and be entered to win an AUDIO copy of Leave it to Cleaver! 2 - Enter before midnight, March 22nd. 3 - US and Canada only, please! Well, so far, that first day of spring brought more snow! But I know it won't be long before the bulbs start coming up! Looking forward to continuing with this series! Thanks for the chance to win! It's cold, snowy and windy but then winter took about a month off back in Feb. so it doesn't surprise me LOL barbie17(at)gmail(dot)com So glad the series is continuing and thanks for the giveaway chance! Our spring in northern Arkansas started our with cool, drizzly damp, dreary days. However, thing are blooming and budding. The Bradford pear and tulip trees are blooming as well as the daffodils. Some trees are budding out so it won't be long before the mountains are green again and the grass will need its first mowing. After seeing places in the United States that are white with snow and freezing temperatures, I'm not going to complain about a bit of cool and damp weather. I'm ready for spring and warmer temperatures so we can spend some time outdoors. 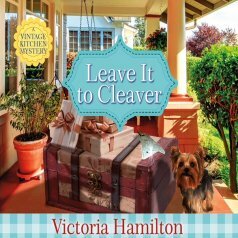 Appreciate the chance to win an audio copy of "Leave it to Cleaver"! Spring in Minnesota can be an extension of winter for at least the first month---some of our biggest snow storms have hit in late March/early April. Fourth northeaster expected this evening - waiting impatiently for spring weather. Spring in Chicago is a lot like Spring is in Michigan. One day it can be warm and beautiful and the next day it can be cold and windy. I'm originally from Michigan and I go back every May for the Tulip Time Festival in Holland MI every year in May. Love audiobooks, thanks for the chance. This is my first Oregon spring. So far, it's pretty much been the same as winter - chilly, but not freezing. It is snowing now, but I am hoping for some flowers soon. Here in Minnesota the snow is still on the ground with temps in the mid 30's. Although we've heard that more snow might arrive this weekend and next week temps might reach the 40's. It's been mid 70's the first two days. I've been waiting for the rain that they keep saying is coming. Maybe tomorrow. I forgot to turn the sprinklers back on since last week's rain. It's getting too dry. In northern California we are getting lots of rain and hoping for lots of mountain snow as the melt is our water source. Our yard has some returning birds and our nest boxes are up and waiting. Spring can be like summer here in Louisiana, but I just woke up to 46°! Spring in Connecticut. Well, we had our 4th nor'easter in 3 weeks.. Need I say more? Spring can't make up its mind, today is chilly but sunny! Right now while the north is getting whipped with snow we've had days going up to 90 degrees. Thank you all for your entries! And for telling me about spring where you are. I have chosen a winner, and have emailed her!! Well, my crazy schedule resulted in not seeing this until this morning. But I will tell you that I live in Port Huron, Michigan, right on Lake Huron and the St. Clair River. I'm just a few blocks north of the Blue Water Bridge. Ah yes, spring in Michigan. Do we get spring? Sometimes. But mostly it's snow one day, sunshine and freezing north winds off that beautiful lake, and more snow, and maybe rain. We do well to get into the 40s, but we're going to be in the 50's next week! We suffer through the crazy hormone swings of Mother Nature, but it's so worth it to get to our glorious summers!